If you have come to this page never having dealt with baby or juvenile hedgehogs before, or having had failures before, PLEASE PLEASE PLEASE contact a rescue with a track record of success. Don't try to look after them yourself without correct support. Hoglets should be fed with a milk substitute such as Esbilac which contains all the fats, vitamins and minerals they need. Under no circumstances should you give them cow's formula which will kill them. Goat's milk with Goat's colostrum may be used for a short period of time if nothing else is available. Products such as Cimicat are acceptable for a short time with the very young hoglets but are not substantial enough to make the hoglets grow. We have found that Shirley's Lactol, Welpi, Canilac and most Kitten milks, as well as human baby formulas, are completely unsuccessful and will always advise you not to use them. a sterile syringe, 1ml, 5ml or 10ml - depending on the size of the feed required. a short piece of rubber tubing such as a cannula, or a Catac teat ST1, also sterile. The powder milk substitutes need to be mixed well so that everything dissolves and we use the Fennel Tea to make it up rather than water as we've found it helps with bloat issues. For some time now we have made up enough feed for a whole day the night before it's required, stored it in the fridge and remixed it the following morning. Don't use an electric whisk or blender as it adds too much air. Refer to the list below for amounts and frequencies. Heat up only enough feed for one sitting and warm it to body temperature. Test it on the back of your wrist as you would for a baby. We use a bottle warmer with a dish in the top to keep the food at the right temperature throughout feeding but others use food warmers with tea lights. 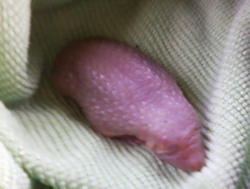 Place the baby on a warm towel on your lap, on a heat mat, or wrap it in a warm cloth and hold it upright, different hoglets prefer different methods. NEVER feed the baby on its back as it may inhale the feed and drown. 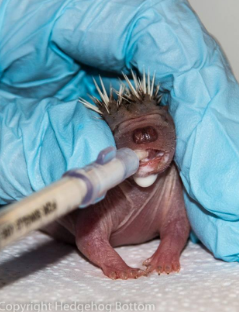 Put the tip of the syringe, or rubber tube if it's a very young hoglet, under the lip and gently squeeze out a drop. Some hoglets will instantly attack the syringe and gobble the lot down, others take a while to get the idea. Feed slowly, do not be tempted to press the plunger hard. The youngest hoglets (pinkies) will need to be toiletted when they come in. If you haven't seen them passing urine or faeces by themselves then you MUST do it for them. A cotton bud dipped in almond oil then gently but quickly tickled around the genital area should do the trick but the tinies have paper thin skin and you can make them very sore. NB. Weights given are a guide only. Once hoglets are a week old there can be a significant weight difference between litter mates and the more there are in a litter the lighter they are likely to be so weights are not given for anything from 1 week - 4 weeks. Weigh the hoglets at the same time each day and make a note of it. This will act as a guide to growth. In addition, weigh before each feed and again afterwards. 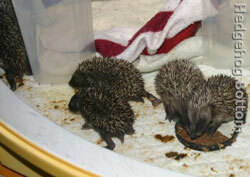 For every 1ml of feed the hoglet has ingested, an increase of 1g weight should be noticed. Do not note these weights down or you will confuse or scare yourself silly. Use your daily weights to track progress. Make sure the hoglets are kept very warm. If they are cold they will use most of their energy trying to keep warm and will not gain weight. Most rescues recommend around 35c for the first couple of weeks until they can maintain their own body temperature. NB. When hoglets first come in DO NOT ATTEMPT TO FEED THE FULL AMOUNTS mentioned below. They feed on demand with mum. We are forcing them to eat on our terms. They need time for their tummy to adjust. Spines are beneath an outer skin. 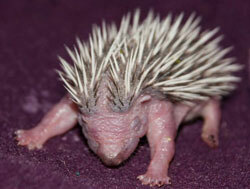 If the babies are born with spines mum may well end up with stuck babies and need a vet IMMEDIATELY. 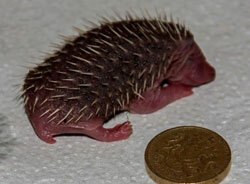 *Hoglets weighing under 12g may be premature. ALL hoglets will struggle if they have not had a first feed from mum. If you have never dealt with these before we STRONGLY recommend you work with somebody who has. These babies are tiny and often highly compromised. The first couple of days are crucial and of you get it wrong nothing you do afterwards will save them. This is not a competition. Let experience help the babies. Mum feeds round the clock for the first few days, never leaving the nest. At 3-4 days she will start to come out at night to feed and water herself. Hoglets may jump if disturbed. Great care is needed not to drop them. 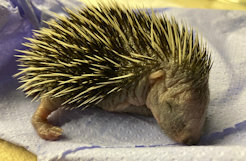 It is often a good idea, especially if this is he first time you have dealt with them, to sit on a low stool or on a carpeted floor so the hoglet has less of a distance to fall. 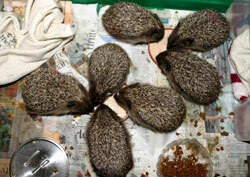 At one week - the hoglets are still blind and deaf. The white spines are still longer than the brown ones. Two weeks - More second coat spines. Please be aware that hoglets are not straight forward to care for. Many things can go wrong along the way and even with the support of a good vet, it's extremely easy to lose the little ones. No matter how much you believe you can raise them, I would beg you to seek expert advice. 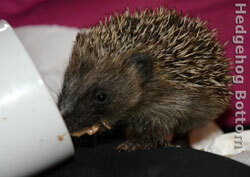 If you go to a good carer they will normally assess the hoglets and then agree a care regime with you. It does not automatically mean you will have to give the animals up. It may be they will be given straight back along with a care sheet, or possibly kept at the rescue for a few days and then returned to you if that's what you want.